Even abstruse business processes, can be understood by anyone looking at the flow chart of the business(flow diagram)! Among variety of 'Flow diagram writing', the advantage of "BPMN, method of drawing Workflow" is people can understand just by looking at it even they don't know the word of BPMN. Recently, not only for companies but, even in government agencies and voluntary organizations, the case of to take advantage of BPMN to review business has been increasing rapidly. It is well-received for "easy to learn to work" to newcomers such as rookies and personnel reshuffling. It is quite reasonable to give priority to BPMN than business manual. 1. Draw in BPMN to exactly share in-house, even if it was a simple business process. 3. Furthermore improve business process based on the results of operation of the information system. By the way, surprisingly it is difficult to operate business process which need to be "in conjunction with paper". Here, we would like to think about "Expense Reimbursement Application" which typical of those 'business in paper'. Rules of notation for visualizing business procedures easy-to-understand showing in the drawing. A modeling method that is effective to describe 'series of business process' which multiple human (or machine) involved. It has the feature such as 1. Can be understood at first sight by the people who are not IT engineer, 2. Directly related to system implementation. Fundamental technology of Business Process Management tool. 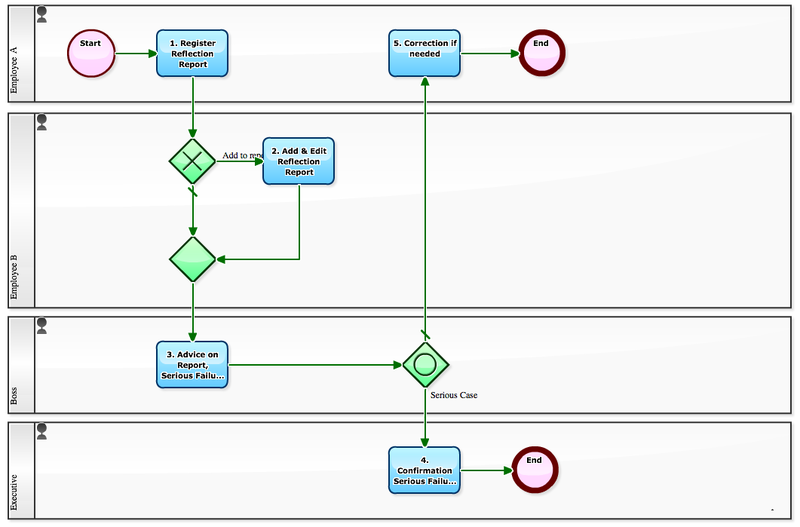 We are using BPMN method in "Workflow Sample" that providing template of business flow.